For this job, I travelled to a house in the town of Fifield, near the city of Windsor, Berkshire. 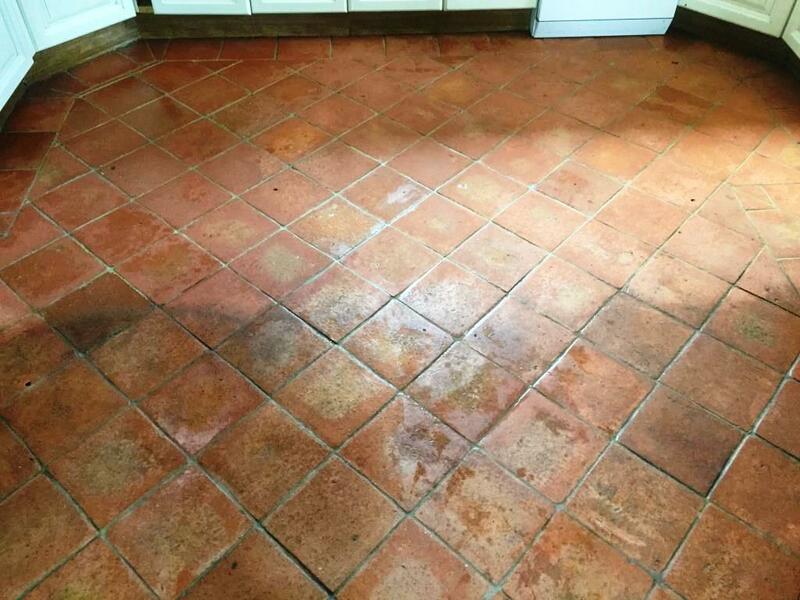 My client’s problem was a heavily soiled Terracotta tiled floor. 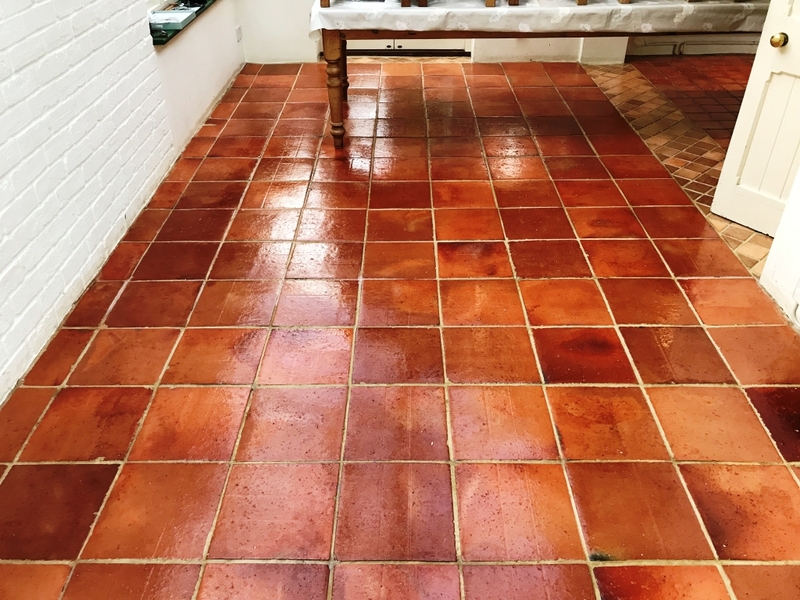 Terracotta tiles have been used for over two millennia, but are known to pick up dirt quite easily due to their porosity and a lack of natural surface glaze. This dirt can become ingrained if not removed quickly. 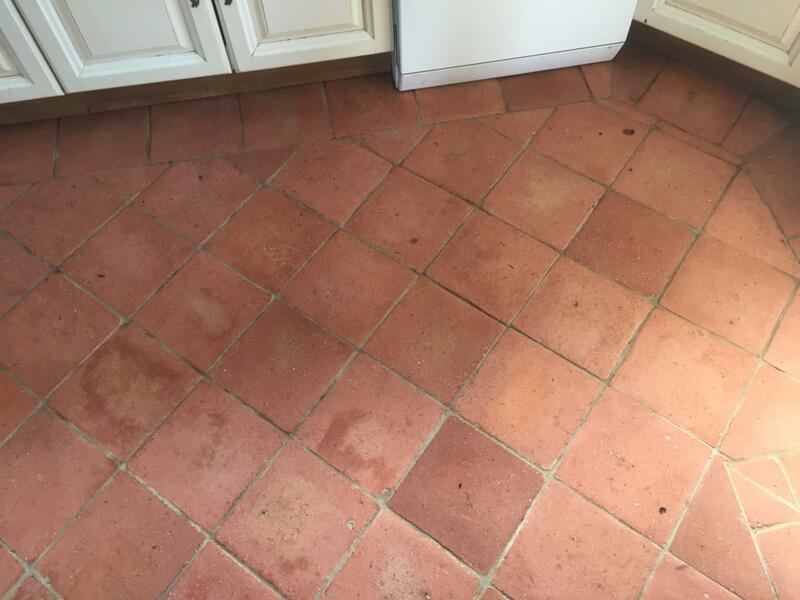 In this particular case, the tiles and grout lines were very dirty, with a small amount of grout haze blemishing some of the newly installed tiles. 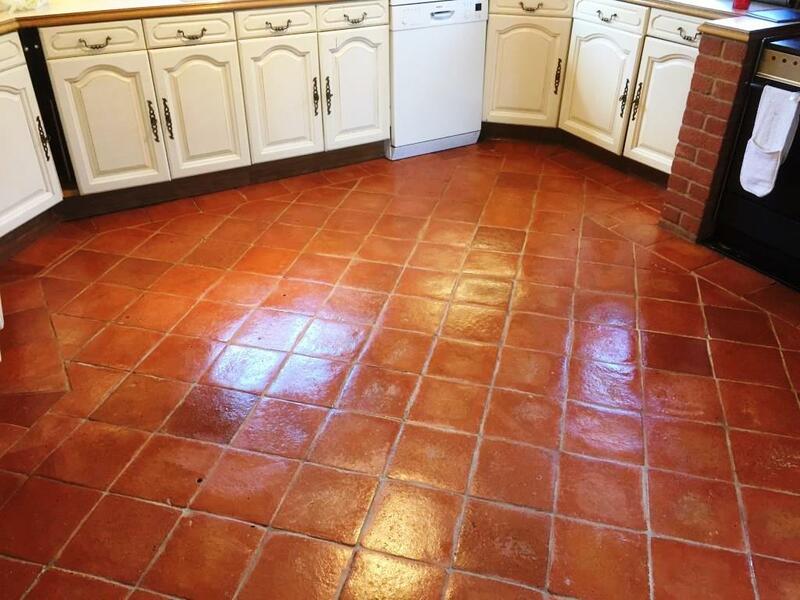 The affected area of the floor required a thorough clean. 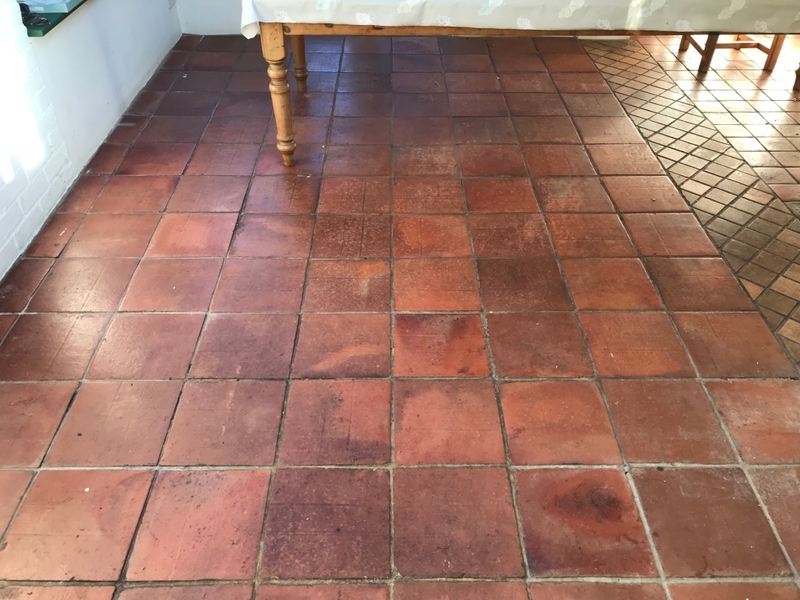 Additionally, most of the old sealer had worn away, further exposing the tiles to dirt and damage – this would need to be replaced. 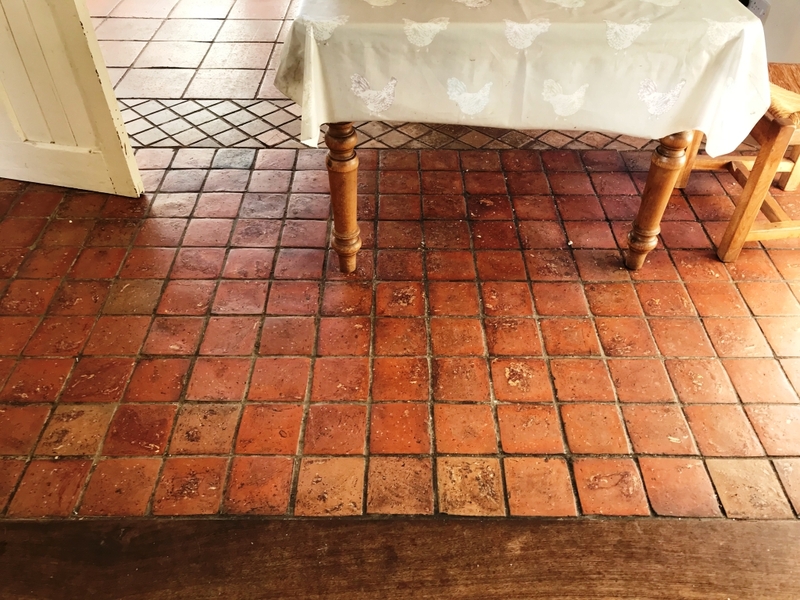 To clean the floor, I first used Tile Doctor Remove & Go, a strong multi-purpose stripper/cleaner which as its name suggests is designed to remove any old sealer left on the surface. Working in sections, I sprayed down a layer of Remove & Go, before leaving it dwell for roughly 5-10 minutes. 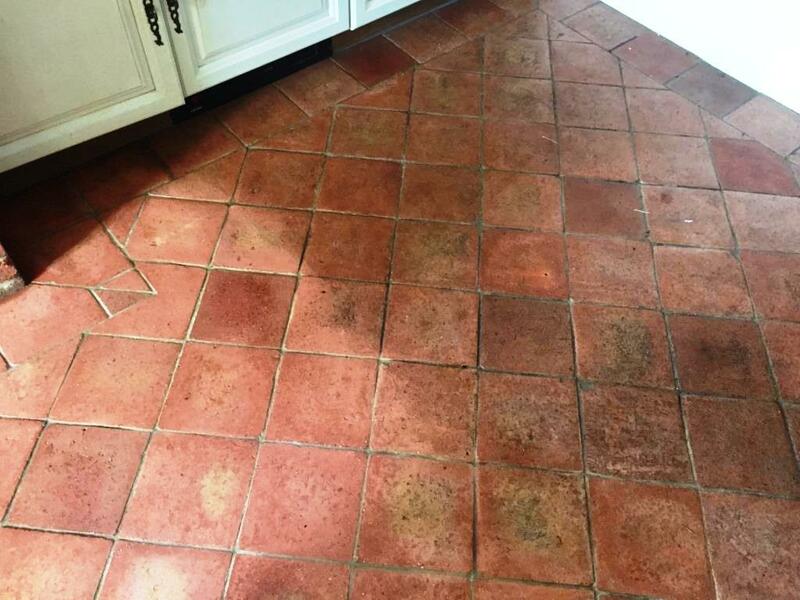 While Remove & Go was soaking into the Terracotta, I scrubbed the grout lines using a stiff grout brush. This helped to lift out the ingrained dirt and grout haze. 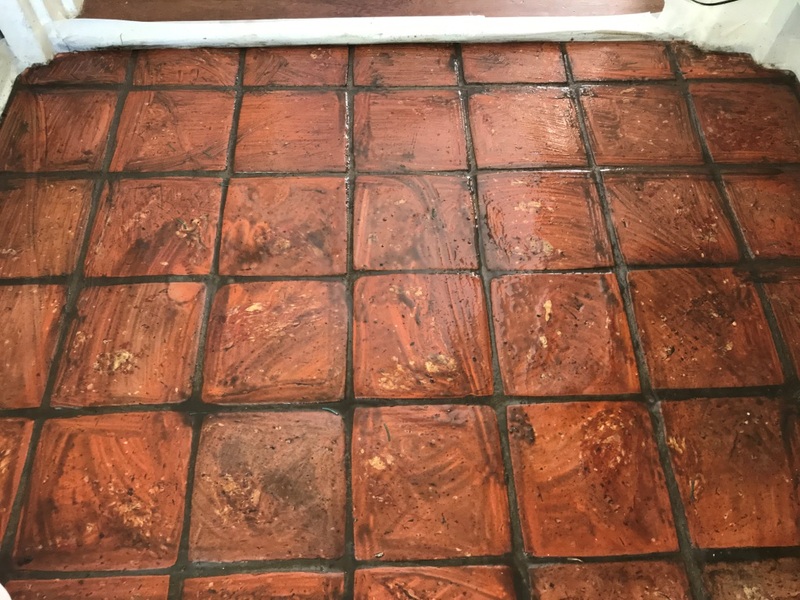 After I was done with the grout my attention went back on the tiles, so I added a small amount of water to form a solution, which was then scrubbed into the affected area using a heavy weighted rotary machine and a stiff agitation pad. 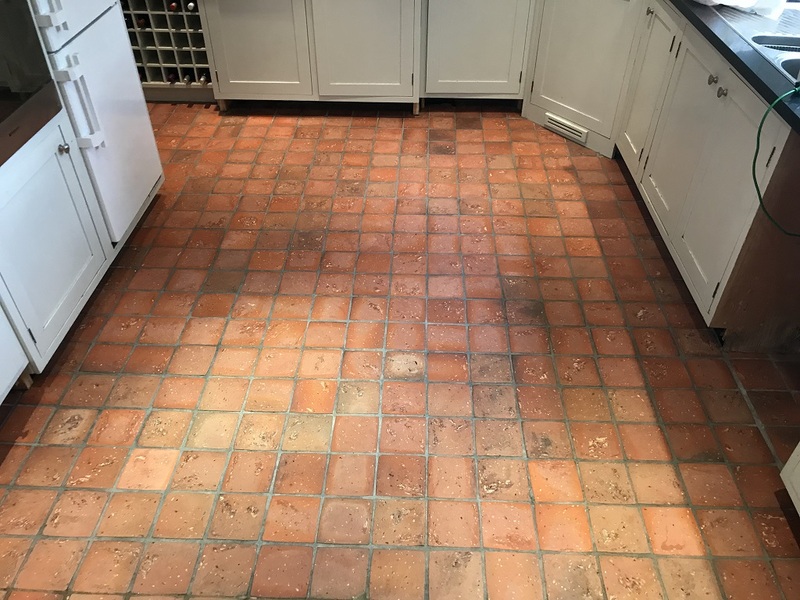 The floor was then rinsed using a high pressure hot water tile and grout cleaning extraction system to remove any remaining soils, pollutants, debris and old sealer. 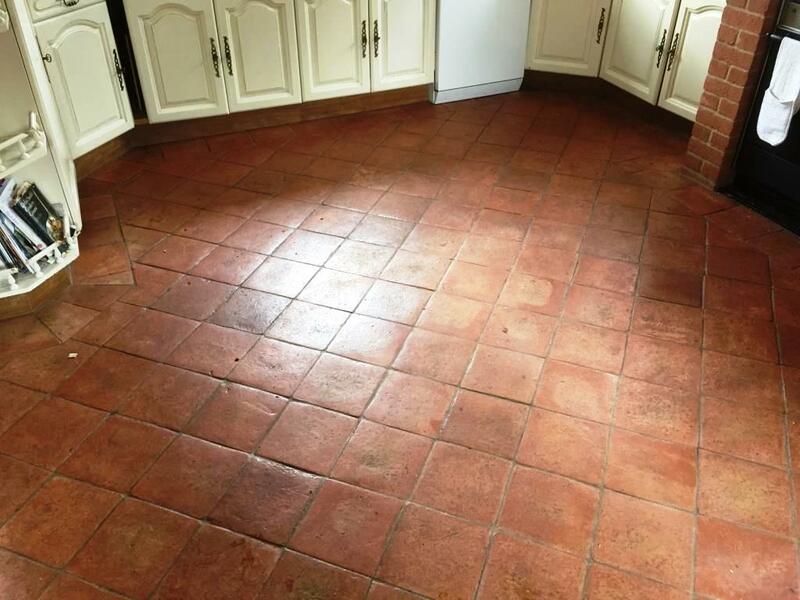 After cleaning, the floor was inspected to ensure all of the issues had been dealt with. Following this, it was treated to a final rinse. 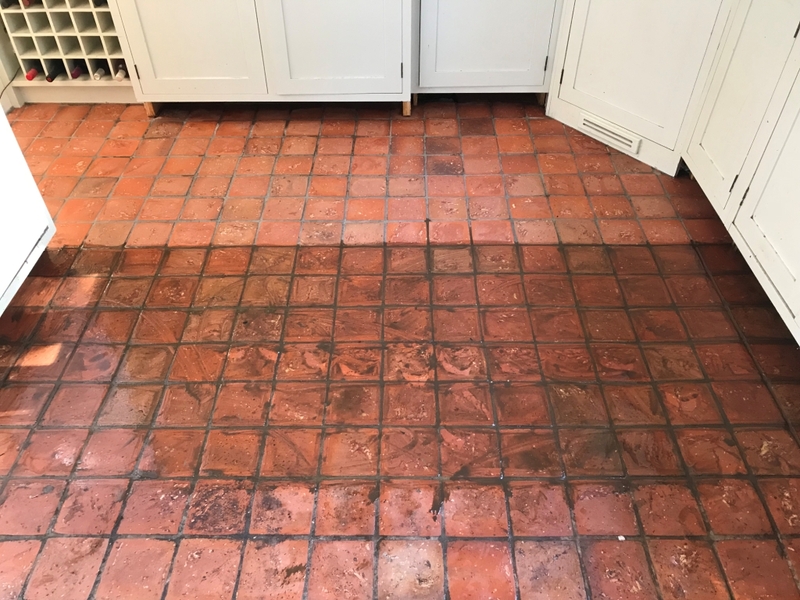 The floor was then let to dry overnight. 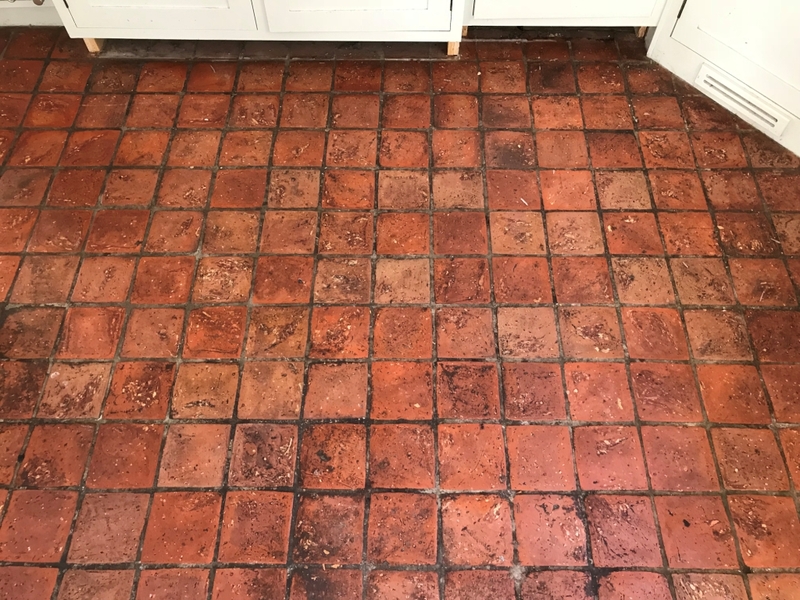 Thanks to the Aga cooker and damp proof membrane under the floor, the tiles and grout were clean and completely dry, ready for sealing the next day. 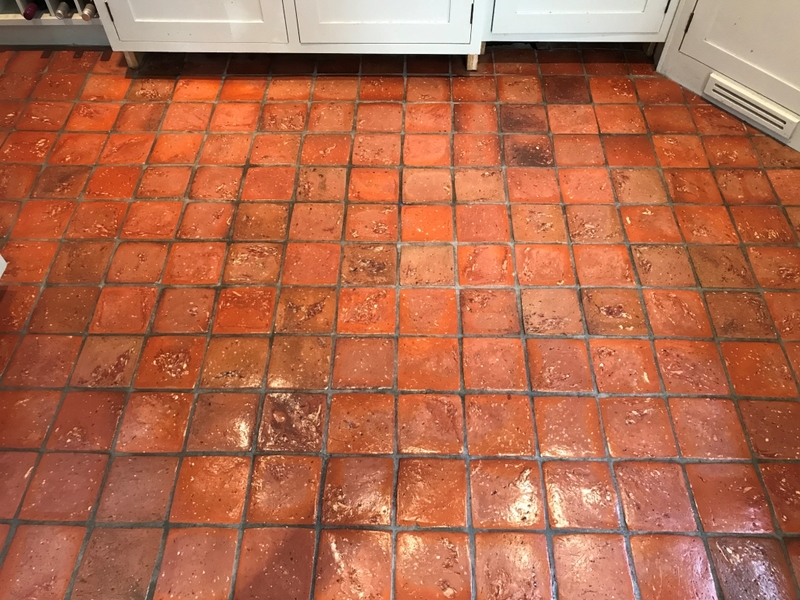 I sealed the floor with 6 coats of Tile Doctor Seal & Go to provide a healthy, durable seal, which also gave the tiles aesthetically pleasing sheen. 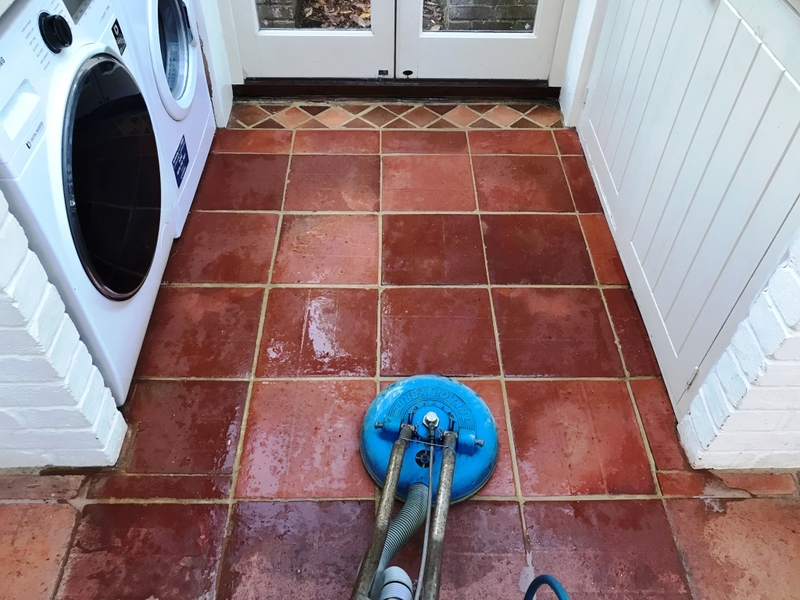 As you can see from the photograph, the clean and seal made a marked improvement to the condition of the tiles and grout – and my client was very pleased!